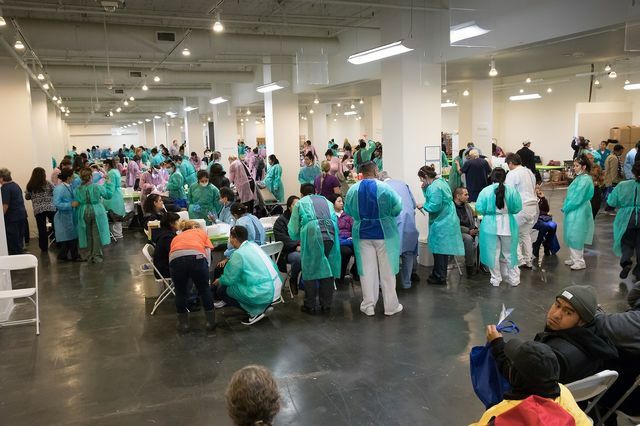 Volunteer dentists treat some of the 1,200 patients who received cleanings, fillings, extractions, partial dentures, root canals and oral cancer screenings at the 2017 Care Harbor Clinic. 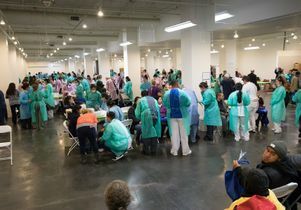 Hundreds of health care workers from UCLA Health as well as students volunteered their time and expertise at the free, three-day Care Harbor health clinic in Los Angeles. 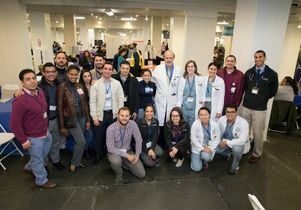 More than 300 physicians and nurses, dentists from the UCLA School of Dentistry, ophthalmologists from the UCLA Stein Eye Institute and members of student volunteer groups signed up to work at the clinic that brings together community partners to care for thousands of uninsured,underinsured and at-risk people from across Southern California. 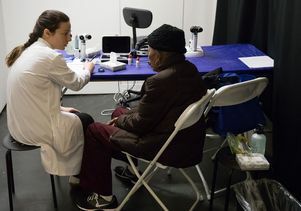 Dr. Laura Ann Vickers, an attending fellow at the UCLA Stein Eye Institute and a volunteer at the Care Harbor Clinic, talks to a patient. Participants also received information on follow-up care and prevention resources. About 2,200 patients obtained free services at the event held at the Reef Event Center from Jan. 20-22. Ramiro Mendoza traveled from Indio primarily for dental work, but also sought out advice for back pain. One of the volunteer doctors referred him to a specialist for further examinations. He was happy that the clinic was available to him, noting that health care can be expensive. “Sometimes you don’t have the resources to go to the doctor’s, so this is very good,” he said. Although the Affordable Care Act (ACA) has provided health care for many, there is still an immense need for access to quality, low-cost care. Dental care has been one of the biggest needs cited by patients during the six years the Care Harbor clinic has been held in Los Angeles. More than 1,200 patients received dental services including cleanings, fillings, extractions, partial dentures, root canals and oral cancer screenings. At this year’s event, a special focus was put on diabetes prevention and education. The UCLA Stein Eye Institute offered complete eye exams to diabetics, which is important because annual screenings can help detect diabetic retinopathy and diseases of the eye that can cause blindness. “Care Harbor is a way to reach out to them, provide care and make sure they don’t lose their vision and go blind,” said Dr. Anne Coleman, director of the Stein Eye Institute’s Center for Community Outreach and Policy and the Fran and Ray Stark Foundation Professor Of Ophthalmology. Neda Shamim, a cardiothoracic intensive care nurse with UCLA Health and first-time volunteer at the event, said the scope of the event was impressive. “The patients seem very excited and thankful that we are here to help them, and they appreciate how many specialties are here and the care they’re receiving,” said Shamim, who worked at the diabetes education station teaching patients how to better manage their disease. 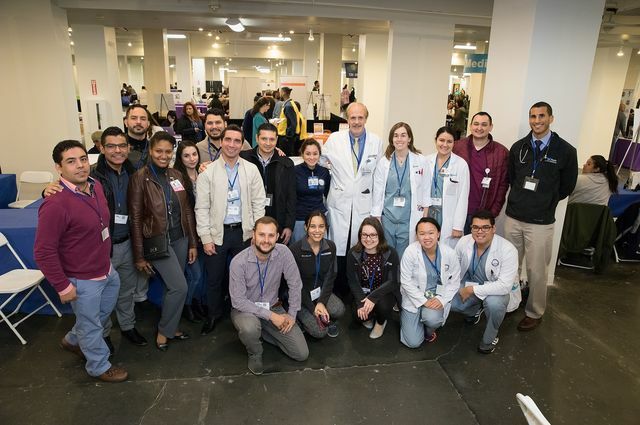 About a dozen student volunteers came from the UCLA Department of Family Medicine’s International Medical Graduate Program, which helps immigrant medical school graduates from Latin America, who are legally residing in the U.S., earn their California medical licenses and obtain residencies in family medicine. In exchange, the physician commits to practicing in one of the state's underserved communities for two to three years after completing his or her family medicine residency. The international graduates primarily served as translators for Spanish-speaking patients. Karen Fourie, who attended medical school at the Universidad de San Martín de Porres in Peru, said she welcomed the opportunity to serve a community at Care Harbor. “For me it’s really important to be part of my community,” Fourie said. Dr. Patrick Dowling, chair of the UCLA Department of Family Medicine, has been involved with Care Harbor from the beginning. He is with fellow physicians and students from the International Medical Graduate Program, who acted primarily as translators at the free clinic. Dr. Laura Ann Vickers is an attending fellow with the Stein Eye Institute. She's volunteering at the Care Harbor Clinic. 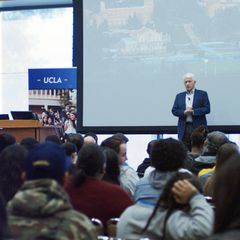 Previous Story L.A. Lakers, UCLA hospital staff embrace new partnership Next Story UCLA faculty voice: The U.S. already tried ‘extreme vetting’ for Muslims. It didn’t work.